Tonight sci-fi veteran Ronald D. Moore makes his long-awaited return to the small screen with his Antarctic outbreak story Helix on Syfy. But that’s apparently not enough to fill his time, because he also has an adaptation of Diana Gabaldon’s Outlander novels for Starz, which will premiere later this year. 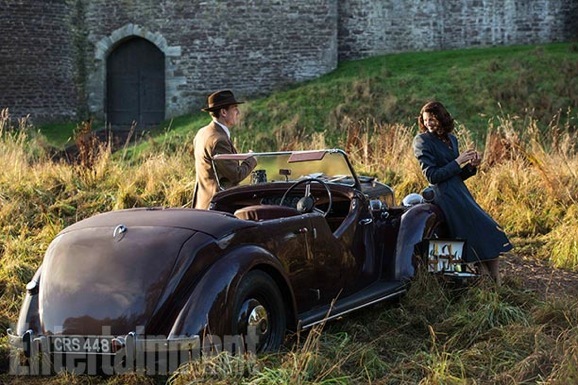 A time-jumping multi-period piece, there is a new old-timey Outlander photo for us to peruse. Moore has been busy on the promotional trail, hawking his wares, and has taken the time to talk about everything from his own shows, to Star Wars, Star Trek, and even Game of Thrones. The story of Outlander follows a married 1940s combat nurse named Claire (Caitriona Balfe). On vacation with her husband (Tobias Menzies) in Scotland, she manages to tumble through some kind of portal into the 18th century. There she falls in love with a young warrior bro, played by Sam Heughan. As you can see, this photograph, which appeared in EW, is definitely from Claire’s pre-time travel days. She’s just hanging out in a field, having an awesome car with running boards, though I feel like having a convertible in Scotland has many of the same drawbacks as owning a similar automobile in Seattle. In the accompanying interview, Moore discusses what drew him to the project. We have a ton of good sci-fi television to look forward to in the new year. New entry Almost Human is coming back from a mid-season break, as is NBC’s post-apocalyptic drama Revolution. Not only are shows like Continuum and Orphan Black returning with new seasons in the coming months, there are newcomers like Believe and Intelligence on the horizon as well. Genre fans are also looking forward to Ron Moore’s return to the small screen. He hasn’t made much of an impact since Battlestar Galactica wrapped up, but he has two new programs on the way in 2014. In addition to an adaptation of Diana Gabalon’s popular Outlander series of novels, his biological horror show Helix will debut on Syfy in less than a week, and now you can check out the first 15-minutes of the premiere. Helix is one we’ve been curious about. The concept is strong, and resembles John Carpenter’s The Thing, but what we’ve seen in the form of promos, clips, and teasers hasn’t exactly set our world’s on fire. Still, it’s Moore, and the man is something of a sci-fi guru, so we’re willing to give him the benefit of the doubt. However, these 15-minutes, much like what’s come before, don’t inspire the greatest confidence. 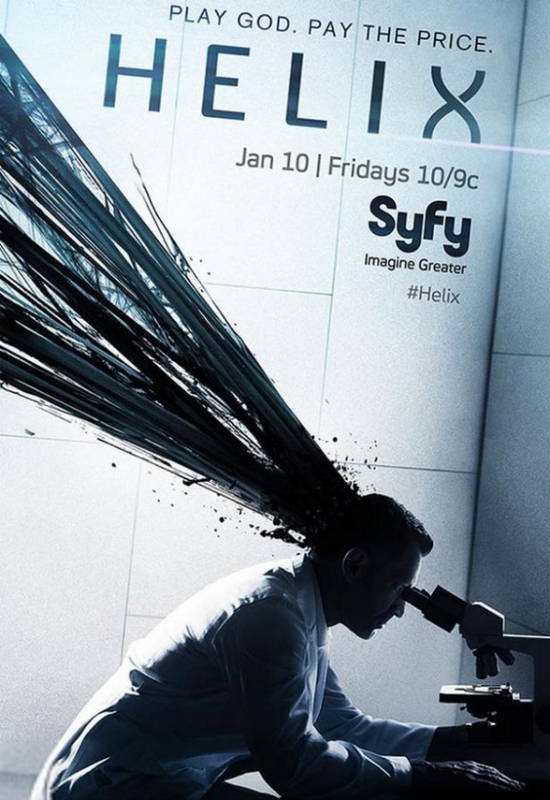 2014 is going to start with a bang with Syfy’s new science fiction TV series Helix. The newest show from writer/producer Ronald D. Moore will examine the boundaries of science and the perils of playing god. While the series doesn’t premiere until January 10, Syfy has released some haunting new viral videos hinting at the series’ central mysteries. The first video is in Japanese without English subtitles, so I’m not sure what to make of it. One of the main characters on Helix is Japanese scientist Dr. Hiroshi Hitaki, the head of Arctic Biosystems, the backers of Helix‘s mysterious Arctic research center. While I don’t understand Japanese, the video is chilling. Not just its snowy landscape, but also the idea of dying a horrible death in the middle of nowhere. 2014 Midseason TV Premiere Guide: What’s Coming Back When? We’re in the midst of the holiday doldrums when it comes to TV, so unless you’ve had a serious craving for Christmas specials or the odd marathon, your choices have been limited. (Then again, I’m sure a lot of you have been like me — using the barren TV landscape as an excuse to binge-watch stuff on Netflix.) Thankfully, the winter break is about to be broken, with shows returning or premiering beginning next week. So settle into the comfy chair and pull up that DVR menu, it’s time to schedule the next few months of TV sci-fi. Okay, okay, so Community isn’t really science fiction. But it is hilarious, and since creator Dan Harmon has returned to the show, we can now recommend it again in good conscience. Besides, it’s delved into alternate realities and was nominated for a Hugo, so that puts it right inside our wheelhouse. In a few weeks, the newest TV series from creator Cameron Porsandeh and executive producer Ronald D. Moore will air on Syfy. Helix is one of the bright spots in science fiction in the New Year, so to get ready for the craziness the horror/sci-fi TV series is about to unleash, the cable network released new trailers and images for Helix‘s series premiere in January. The first trailer is an overview of Helix. It features cast members talking about the series and what audiences should expect from the new TV show. While the concept might make you think the cast would only feature scientists, the trailer reveals a military aspect as well. It still looks like a mix between John Carpenter’s The Thing and Moore’s Battlestar Galactica reboot. “Play God. Pay The Price.” In early 2014, we will be treated to new science fiction TV shows such as Alfonso Cuarón and J.J. Abrams’ Believe on NBC and Ronald D. Moore’s Helix on Syfy. To get viewers ready for the new sci-fi outbreak series, Syfy has released a new poster that hints at the strange creature/disease/whatever menacing the show’s characters. The new poster features a faceless scientist looking into a microscope, only to have the series’ strange black gooey substance blast out the back of his head. It’s actually a pretty disturbing image. 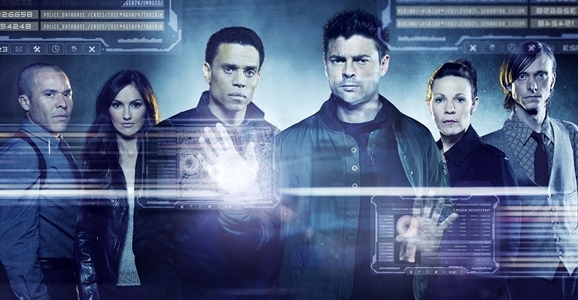 Recently, Syfy also released new trailers to get new fans ready for Helix‘s series premiere. Everything we’ve seen surrounding Helix really makes it look like the TV version of John Carpenter’s The Thing. However, this time around it looks like the inky-black creature or substance might be man-made rather than an alien lifeform from elsewhere. It also appears that the new series will also have elements of Dr. Jekyll & Mr. Hyde, so the series can keep its audience on its feet with its mystery and secrets. Nevertheless, the body count on Helix should be high considering the “monster movie” element of the TV series.